Updated data on the legislative productivity of the 113th Congress is available here. Congress made big news last week when it managed to pass a bill that both keeps the government running through Dec. 11 and authorizes the Obama administration to arm and train Syrian rebels to fight the Islamic State. The vote, unlike so many in Congress, blended party lines: 176 Republicans and 143 Democrats voted for it in the House; 44 Democrats, 33 Republicans and one independent in the Senate. That was arguably the biggest accomplishment of the short September sitting, as the 21 other measures (most not yet signed into law) that made it through Congress mainly ran toward the relatively noncontroversial — reauthorizing existing programs, extending advisory committees, and other tinkering around the edges of statute law. 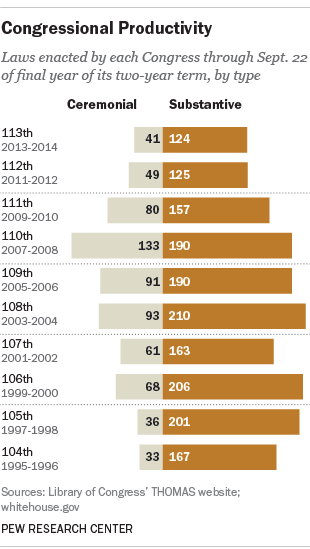 Even so, the current Congress remains on pace to be one of the least legislatively productive in recent history. As of Monday, 165 laws had been enacted since January 2013, 124 of which were substantive by our deliberately generous criteria (no post-office renamings, commemorative-coin authorizations or other purely ceremonial laws). Both those figures are the lowest of any Congress in the past two decades over an equivalent timespan. Twenty other bills, by our count, are headed to President Obama’s desk, but they won’t count as becoming law until he signs them. And Congress isn’t scheduled to return for its lame-duck session until Nov. 12 (although, as National Journal pointed out, the House has been in session for 117 days this year, more than it’s typically worked in recent election years). Congress has much unfinished business to tackle when it does reconvene, but what are the chances it will end its term in a blaze of legislative activity? Not good: Based on data going back to 1995, Congress on average has passed about 60% of all its laws by this point in its two-year term. If the current Congress fits that pattern, it will end its term with about 275 laws to its credit — the fewest of any Congress in the post-World War II era, according to Vital Statistics on Congress (a joint production of The Brookings Institution and the American Enterprise Institute). Of course, there are other ways to measure congressional productivity: Congress may be passing fewer laws, but the ones it is passing are getting longer.